Police officers are prepared to deal with a variety of unusual situations, but sometimes they just have to wing it. 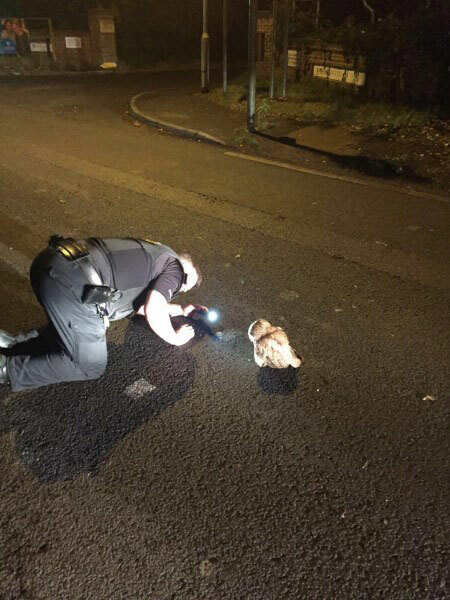 When this lone owl was found obstructing a highway in south-east England, officers on night patrol for the Thames Valley Police stepped in to deal with the unlikely offender. A photo shared to the force's Facebook page shows an officer "apprehending the suspect", and it's been shared over 200 times. "After some initial resistance and failure to comply, PC Justin Barton took [the owl] under his wing and showed him to the side of the road to carry on his journey," says the update. After seeking advice from wildlife experts at the RSPCA, the officers checked that the owl was responsive and uninjured before moving it to safety. Owls are sometimes drawn to roadways by the warmth of the tarmac or the lure of a scuttling rodent. Fledglings also spend time on the ground when they're learning to fly, where they're sometimes scooped up off the roadside by concerned citizens and dropped off unnecessarily at animal rescue centres. Although it's difficult to tell from just a single image, the avian culprit here looks like a tawny owl, the most common and widespread owl species in Britain. It's possible that the little jaywalker was stunned by the headlights of a passing car and became disorientated. According to vision expert Dr John Douglas Pettigrew from the University of Queensland, the eyes of both birds and mammals can take a long time to adjust, up to 30 or 40 minutes, when exposed to bright light. "A nocturnally hunting bird would therefore be out of action in dim light for around one hour after being exposed to the spotlight [or other bright light source]," he notes. The officers did the right thing by moving the bird out of harm's way, but it's always a good idea to consult wildlife experts first when picking up a wild animal from the roadside. Whether or not an owl should be picked up and moved depends on the species and the age of the animal, according to the UK Barn Owl Trust. Tawny owls should always be left alone unless it's clear that they're suffering from some kind of injury. For more info on what to do if you come across a stray owl, visit the Barn Owl Trust website.